2. Taiwan spindle and leading screw, Japan servo motor. 3. Gantry type frame, Nitrogen balancing system. 1. Table size: 2100 x 1200mm. 2. Travel: 2000 x 1500 x 750mm. 3. Distance between spindle and table: 120 - 870mm. 4. Spindle rotation: 6000RPM. 5. Spindle taper: BT50. 6. Spindle motor: 22kW. 7. 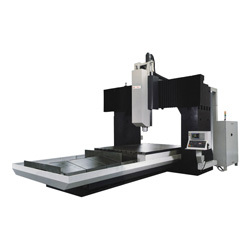 Rapid feed of X, Y and Z axis: 15m/ min, 15m/ min, 12m/ min. 8. Cutting feed: 5m/ min. 9. Positioning accuracy: 0.008mm. 10. Diemension: 7200 x 3800 x 4000mm. 11. Net weight: 270000kg. 12. Max. load of table: 4000kg.